Current research has not yet determined the precise date of the church’s construction nor does it shed light on the architect. More, however, is known about subsequent alterations. In the 12th century, the church was raised to protect it from the frequent flooding of the Tiber. Innocent II re-consecrated the church in 1143. 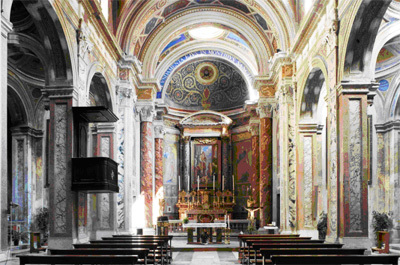 The church was reconstructed in 1716 by Pope Clement XI and restructured by the architect Francesco Azzurri in 1860. During the 17th century, the bell tower was lowered by two levels for structural reasons. In 1726. the church was entrusted to the pastoral care of the Fathers of Christian Doctrine, who built their first schools in Rome on the adjacent block. It currently houses the General Curia of the Fathers of Christian Doctrine. Immediately after the events of 1860 the church of Santa Maria in Monticelli was confiscated by the Italian government and is now owned by the Ministry of Interior, the Public Fund for Religious Buildings. The church was a parish until 1900. In the past thirty years the arches of the bell tower have been closed and the tomb of St. Cesare De Bus, the founder of the Order of the Fathers of Christian Doctrine, was built from scratch. While closed, the church suffered some degradation due to the elements. Recently reopened, the church has revealed precious works of art. Santa Maria in Monticelli was built on the Latin cross plan, with a short transept and three naves. The interior decorations testify to the complex historical events behind the church’s creation, covering a rather wide time frame, beginning in the 11th century with a beautiful depiction of Pope Pasquale II on the perimeter wall (on the right side of the entrance) up to the recently built tomb of St. Cesare. The apse features the Head of the Redeemer, recently restored, which dates back to the 12th century. The aisles are punctuated by three chapels. The two symmetrical chapels surrounding the transept are dedicated to a holy icon of the Jesus of Nazareth, on the right, and to St. Cesare’s tomb, on the left. In the first chapel on the left, The Flagellation of Christ by Jean Baptiste Van Loo. In the third chapel on the left, Madonna with Child and Saints by Sebastiano Conca. In the second chapel on the left, a majestic wooden 14th century Crucifix attributed to Cavallini. It was subject to a particularly invasive restoration in 1967 that caused the loss of pigments that now remain only in trace amounts. In the second chapel on the right, the Flagellation attributed to Antonio Carracci. 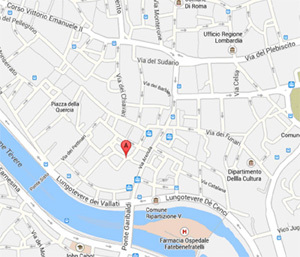 The church of Santa Maria in Monticelli is in the ancient Roman area of Regola in the diocese of the Parish Church of Sants Biagio and Carlo ai Catinari, in an area now behind the Ministry of Justice and densely occupied by sacred buildings and noble palaces. Nearby, are the rectories of San Paolo alla Regola, San Salvatore in Campo, La SS Trinità dei Pellegrini and Palazzo Farnese. Restoration of this historically significant area near the Ministry began in 2006/2007, with the goal of bringing to light the ancient medieval village of Regola. The nearby Palazzo Farnese, designed by Antonio Sangallo Il Giovane and Michelangelo Buonarroti, preserves, among other things, The Triumph of Bacchus and Ariadne by Annibale Carracci, with stucco work by his brother Agostino, evidence of the Bolognese family workshop in Regola. 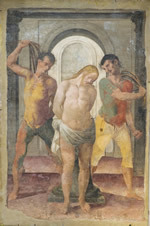 This is further supported by Antonio’s own activity in Santa Maria in Monticelli, whose attributed fresco, the Flagellation of Christ, has been detached and now hangs in the second right-hand chapel. A precise continuity with previous interventions in the nearby medieval village. The area should not be deprived of a significant chapter in its art history. Indeed, to lose La Flagellazione di Cristo by Carracci would be a real tragedy to the broader artistic heritage of Regola. This, in turn, would render incomplete the reconstruction of the Bolognese family’s history in the area. It provides a great opportunity to study the particular historical events that link the paintings of Van Loo and Carracci to the Napoleonic period. Restoration would be of great economic value to the area. With greater visibility of the centrally located church, the area could see up to three million Italian and eleven million foreign visitors each year, especially those from the U.S., Germany, Russia and an increased presence from BRIC countries. The restoration would also support the commitment of the Fathers of Christian Doctrine, a small religious order, who have their general curia within the Church. The order works with numerous missions in India, Brazil and, in particular, in sub-Saharan Africa by facilitating youth education and in assisting in start-up activities and material support. The painting is attributed to Antonio Carracci, Annibale 's nephew and son of Augustine who is attributed for the frescoes in the Palazzo Farnese, including the aforementioned Triumph of Bacchus and Ariadne. 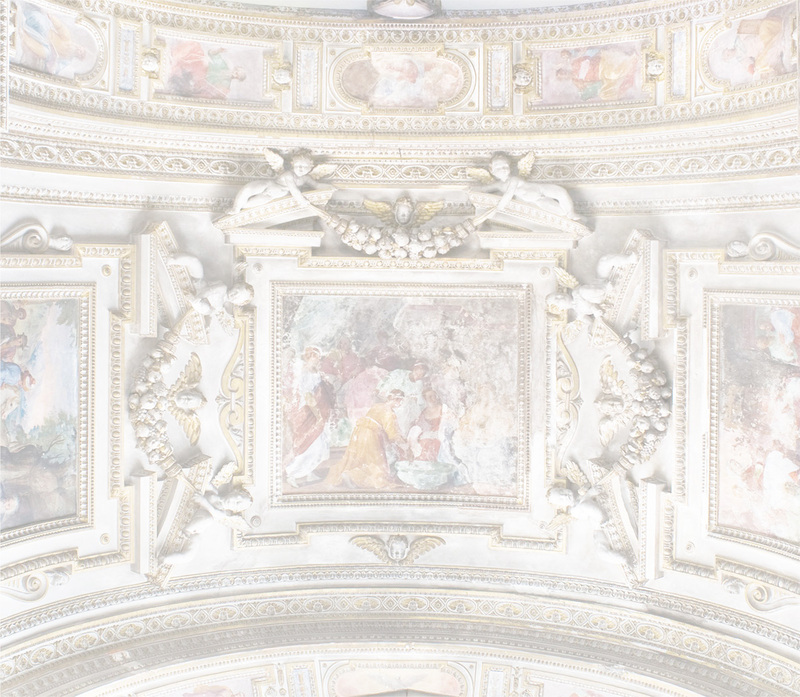 Antonio worked in S. Maria in Monticelli at the time of the decoration of the Palazzo Farnese (1595 - 1605), probably soon after his father's death on March 22, 1602 in Parma. La Flagellazione di Cristo is a fresco on a support of 220 x 150 cm approx. The dividend is ancient, in fact dates back to the age of Napoleon as would be found in S. Maria in Monticelli in 1860 under the painting of the same subject by Van Loo. The trick ensured the preservation of the fresco during the Napoleonic occupation of Rome that marked the release in France of many works of art and would be a witness to the preciousness of the painting as well as, in retrospect, of his valuable paternity. Visual examination, from a distance, cannot state with absolute certainty if it is a detachment of the paint film and the original plaster, the work is fairly good overall but requires a technique of intervention; at present we know neither the time nor the precise original location of the work. It is likely that the restoration can shed light on and provide new insights. The work appears blurred by layers of dust and whitish patina, probably due to the crystallization of soluble salts on the surface, deposits of translucent aspects whichmust be attributed to altered protectives or detachment of the hill and can be seen in perspective, with raking light from a particular height; minute drops of color, uneven treatment of remaking around the fragment up to the edge of the support panel. Finally, the color of the field of plaster is annoyingly uneven within the frame.